Presupposing you already found the eye texture you like, so open up your eye template and lets start. 1. When you close the first four layers you get the basic template for orientation. You can easily see the lines of different eye parts such as pupil, iris and outer eye space. 2. Paste your eye texture in a new layer and make sure the iris and pupil match the orientation template. If needed resize you texture. Still depends of what effect you want. For different effects, just play with the size, style and colors of eye parts. 3. 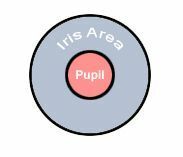 Once you achieve the desired look of your pupil and iris start thinking of a neutral, more realistic outer eye part. The white part looks really unreal when uploaded in-world, so I suggest you to find a texture that will fit your deires or create one yourself. 4. Save your finished eye texture as .TGA file and launch Second life. 5. Once in-world go to files and click on upload image. Uploading different files such as images, sounds, animations, etc. will cost you 10 L$ so make sure you have them on your account. When transfer is done you get a window saying that you paid 10L$ for uploading. 6. 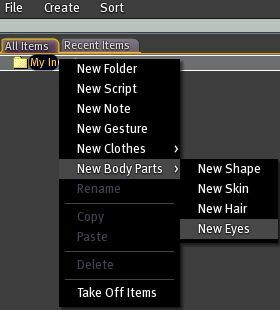 Open up your inventory, create a new folder and rename it as you like - of course. Once done, right click on it and select NEW BODY PARTS - NEW EYES. This will create a blank - default eye texture. Right click on the item, rename and select wear. a square with a default eye picture and two scrolls on the right. Click on the square and select the texture you uploaded before. Take a look at your avatar eyes. The last thing to do is to play with the two scrolls to achieve the desired look. Neutral? Unneutral? Light? Perhaps dark? It's up to you. You have your eyes done. I suggest you to make them in different colors, too. Just repeat the steps and choose the color that looks best. Collect your colors and make a set. You want to sell your collection? Check the other tutorial for more explanations.